HomeBlog postseLearnSecurity Review Contest – Winners Revealed! 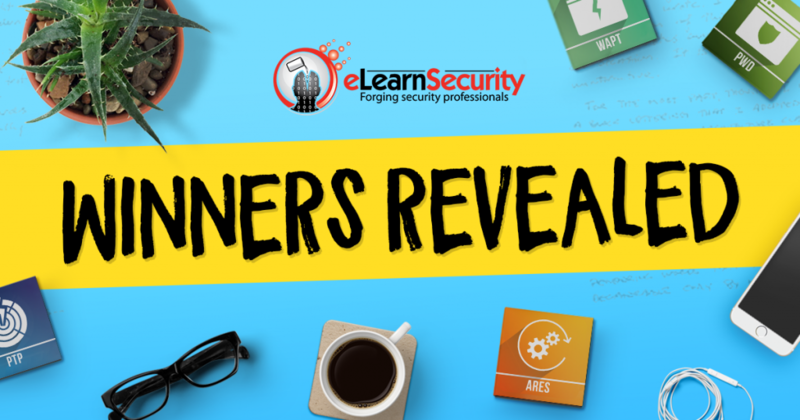 eLearnSecurity Review Contest – Winners Revealed! After five long days of grueling deliberation (and a little bit of heel-dragging), the panel has finally come to a consensus. We’re now ready to announce the winners of the eLearnSecurity Review Contest! It’s been a pleasure reading all of the submissions, and we’d like to thank everyone who participated for taking the time to put your training experience into words, and sharing them with us and the community. Before revealing who our ten winners are, here is a compilation of the reviews that were entered into the contest. Pellegrino C., How do I get started with Cybersecurity? Each one of them is now faced with the tough decision of selecting his/her prize. As you already know, winners are free to choose from ALL of the eLearnSecurity training courses – which means even the soon-to-be-released Penetration Testing eXtreme is on the table! See why we had to delay the winner announcements for a few days? Big thanks go out to the community for your undying support, and congratulations to all our winners! Our hearts could not possibly be any warmer from seeing the overwhelming love eLS training has received, and we promise to use your critiques and suggestions to drive the quality of our courses forward. We hope to see you back at our next competition!